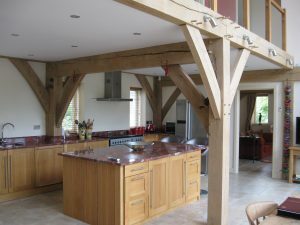 The shape and design of this oak framed house is a direct response to the site layout and its orientation, maximising use of the south facing garden. A first floor balcony overlooks a large, open double height kitchen, dining and living area. The oak frame features some unusual geometry around the staircase, forming a major feature of the design. Externally the house is clad in brickwork as seen from the street. The private garden elevation has a more contemporary look with a great deal of glass and oak exposed. 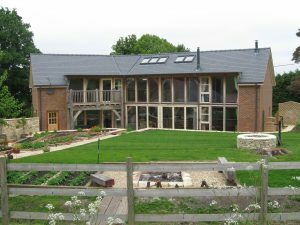 Under floor heating and conventional gas fired heating is supplemented by a wood buring stove as well as solar gain through the windows.